A twist on croutons? A surprising discovery using pumpkin bread! The other night I had a really nice mixed greens salad with goat cheese, candied walnuts, apples and a nice Balsamic vinaigrette. So I decided to make one for dinner tonight. I happened to have some homemade pumpkin bread (a gift from someone at my husband’s office) and cubed it up, baked it at 275 until it was dry and lightly crisp. 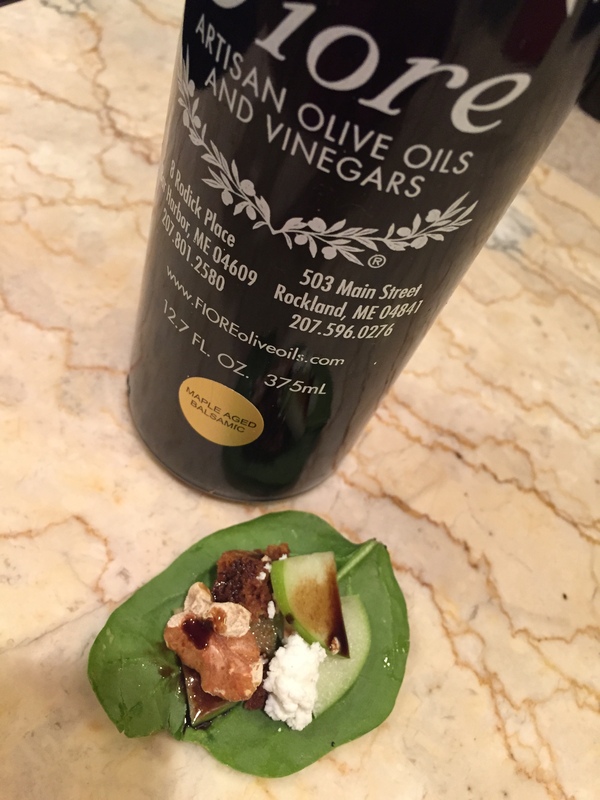 I tossed some baby mixed greens with sliced Granny Smith apples, toasted walnuts, crumbled goat cheese and a drizzle of olive oil and Maple Balsamic Vinegar from Fiore. It was DELICIOUS! The combination was just perfect. A new favorite! Here’s a small bite put together (my sample so I could decide if I should make a big salad!) It’s a GO!